The Federation, in partnership with the Ministry of Children and Family Development (MCFD), conducted a comprehensive review of the residential care practices for children and youth in BC. The scope of this review included residential care services and supports provided in child welfare/protection, youth justice, child and youth with special needs, and child and youth mental health service streams. Since 2012, MCFD has been looking at implementing the recommendations. The first phase of the project (from Spring 2010 to Spring 2011) focused on comprehensive information gathering and analysis. The Phase One Findings Report can be read here. Four key themes emerged from phase one: achieving permanency, delivering an array of accessible residential care services, strengthening foster caregiving, and working together effectively. The second phase of the project (March and April 2011) involved conducting working sessions that engaged foster caregivers, services providers, MCFD staff, youth, and community partners in order to review the findings and generate ideas and recommendations for action. Phase two also included an online survey and interviews with experts, advocates, social workers, families, and children. 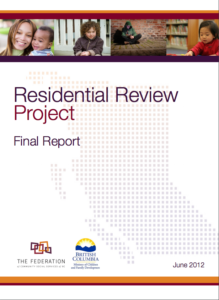 The Final Report with was completed June 2012. It recommends a course of action for both MCFD and service providers that will build on strengths, address gaps and weaknesses, and achieve a planned system of residential care that better meets the care and treatment needs of children and youth, thereby supporting more positive life outcomes. MCFD is developing plans to implement the recommendations and supporting actions. Project Backgrounder: Provides a background on the project’s development, an overview of residential services in BC, a list of advisory committee members, and information about the project team. Annotated Bibliography: Summarizes the key findings from 32 articles from the research literature pertaining to residential care highlighting what appears to support or detract from positive outcomes and experiences. These articles were selected from a review of over 400 research articles and represent some of the best thinking, research, and analysis that is available in the academic literature over the past 5 years. A 2-page summary of main themes is included at the end of the document. A key theme that emerged from phase one was the need to work more intentionally to achieve permanency sooner for children and youth that are in the residential care system. The findings from all sources are summarized, the dimensions of permanency are discussed, and promising practices in other jurisdictions (as well as BC) are noted. As above, this fact sheet summarizes the findings from all sources and looks at recruitment, training, support and retention of foster caregivers. As above, this fact sheet summarizes the findings from all sources and looks at what needs to be considered in developing an array of accessible services and supports in residential care. The primary focus is on staffed residential care (including treatment foster care) and tertiary care.